Over the past decade or so, the use of digital devices and Internet connectivity in children and teens has increased substantially. Children today grow up with digital devices, like tablets, smartphones, computers, and video game systems in the household. They have access to online social media sites, downloadable apps, and other such content at their fingertips. As a result, more and more children and teens are developing addictions to digital media and devices. 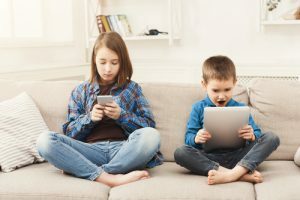 As their addictions worsen, children and teens will start to be constantly connected and have to have some sort of digital device with them at all times. Parents can often spot the signs of digital media and device addictions in children and teens by their responses when they take away devices and do not allow them to get online, play video games, or access social media sites. One of the more typical responses is an unfounded temper tantrum of sorts, where the child lashes out at the parents. This is sometimes likened to the withdrawal symptoms experienced by those with addictions to drugs or alcohol. If your child exhibits this type of behaviour after taking away electronic devices or not allowing them to get online, play video games, or access other such online content, then it is highly recommended for parents to seek help from a qualified family counsellor. Problems falling to sleep or sleeping throughout the night. Children and teens that sleep with their devices on and near them will wake up and respond to status updates, text messages, and so on. Constant use right up to bed time also makes it harder for children and teens to fall asleep. Poor performance in school. If you notice lower grades, failure to do homework assignments and other problems occurring at school, the cause could be from overuse of digital media and devices. The inability to get offline or stop playing video games. If your child or teen cannot stop playing video games or stay offline for an extended period of time, they could have an addiction that requires your attention. Your child or teen is becoming obese. Obesity can be a side effect of a digital media and device addiction. Since they are sitting for extended periods of time they are less active. In addition, snacking and overeating are common when distracted and engaged in online content, social media sites, video games, and so on. A preference to spend time with online friends, not actual friends. When your child or teen spends more time with their online friends than their actual friends, it could indicate an addiction. It can also lead to your child engaging in more risky behaviours they would otherwise avoid when hanging out with actual friends. If you notice one or more of the above symptoms or already suspect your child or teen has a digital media and device addiction, please feel free to contact Bayridge Counselling Centres for help, advice, and family counselling by calling 905-319-1488 today!